The fleeces are getting thicker and this year’s shearer will get them off without one cut or bleed….hopefully. The trick is to get the fleece off before the seeds embed into the fiber. Timing is essential…..
With new lambs on the ground the persistent predators are out early and late in the day. 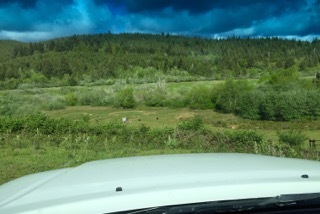 Besides an occasional walk through the brush, the best look-out is in the truck with the stereo playing very softly..!! !